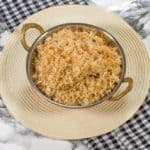 Toasted coconut Caribbean rice recipe – a quick step by step guide in how to make the fluffiest coconut rice using healthy slow released brown rice. 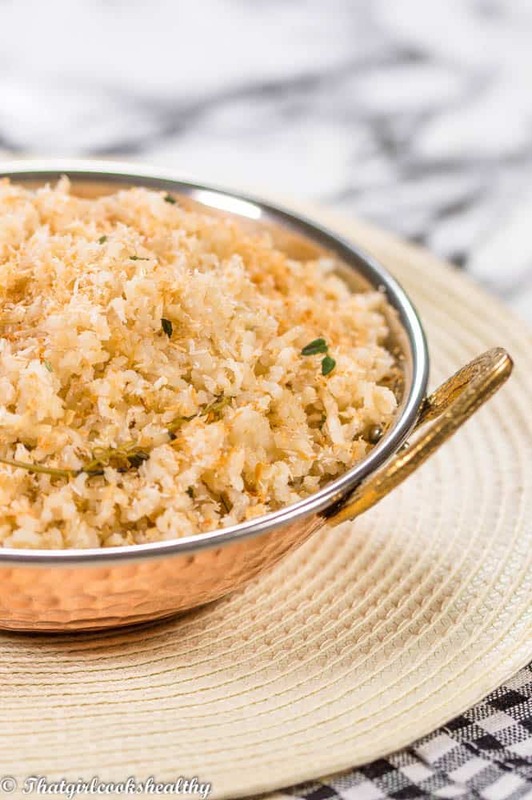 Who doesn’t love some toasted coconut Caribbean rice? Especially when it’s nutritional dense. 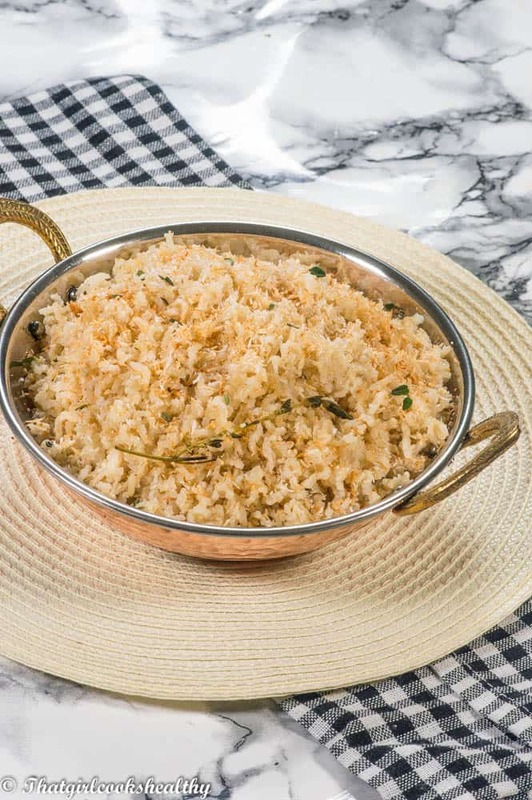 I say this because from my research coconut rice tends to be made with white jasmine rice, my recipe contrasts this idea, as I made mine with brown rice due to being a much healthier substitute. 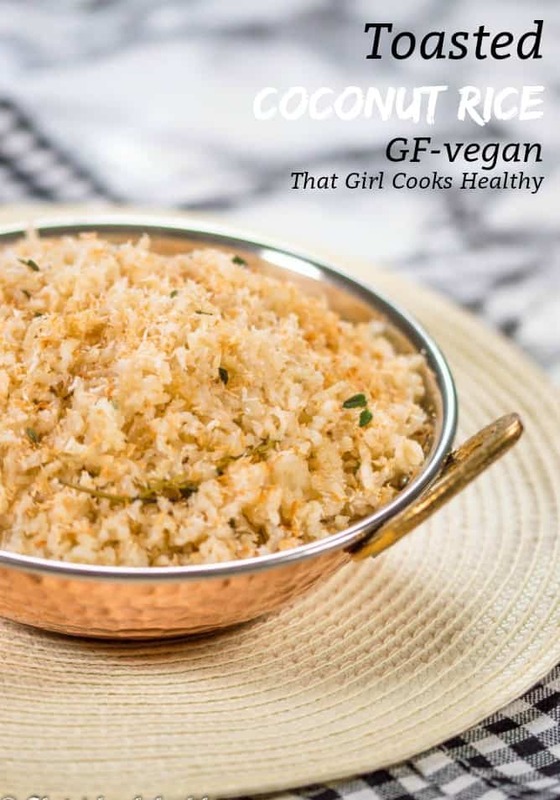 If you’re health conscious like myself or simply keen to learn how to cook coconut rice in its simplistic nature with some toasted coconut flakes then let’s get down to business. In order make yield I subtle coconut taste I went overboard with the coconut by using both toasted coconut and coconut milk to ensure the flavour permeated the rice grains without becoming a sticky mess. You can use my homemade coconut milk. This potent themed combination guaranteed a strong coconut taste. 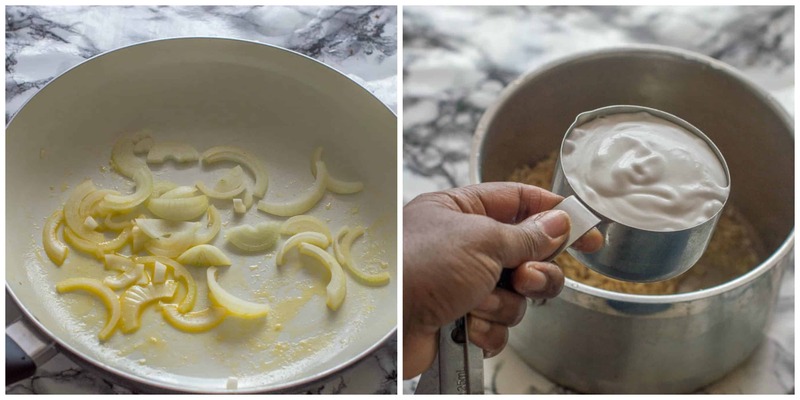 Sauteing the onions – you want to saute the onions in the dairy free butter first and foremost so they are soft and flavoursome. Rinsing off the rice – it says without going that the rice needs to be rinsed off several times to rid by debris. 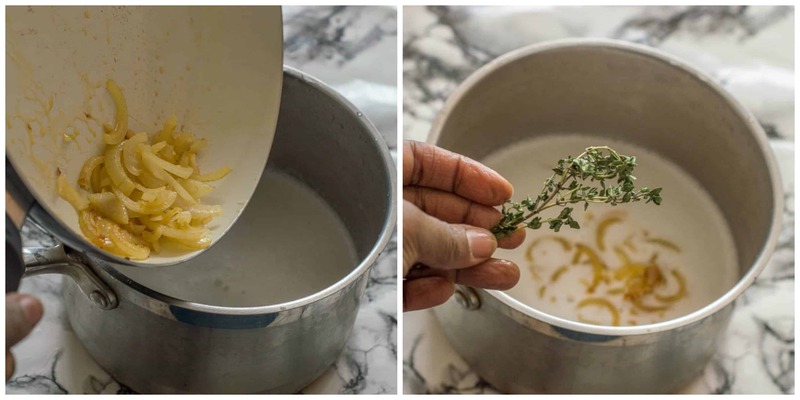 Boiling the rice – I used a combination of coconut milk and some water to bring the rice to the boil before reducing the heat and then adding the pink salt, onion and fresh thyme (can use dried too). Toasting the coconut – Toast about 1/4 cup of shredded coconut in the oven for 5 minutes until golden. This will be tossed into the rice grains towards the end of cooking, before serving. Can I use fat free coconut milk instead? 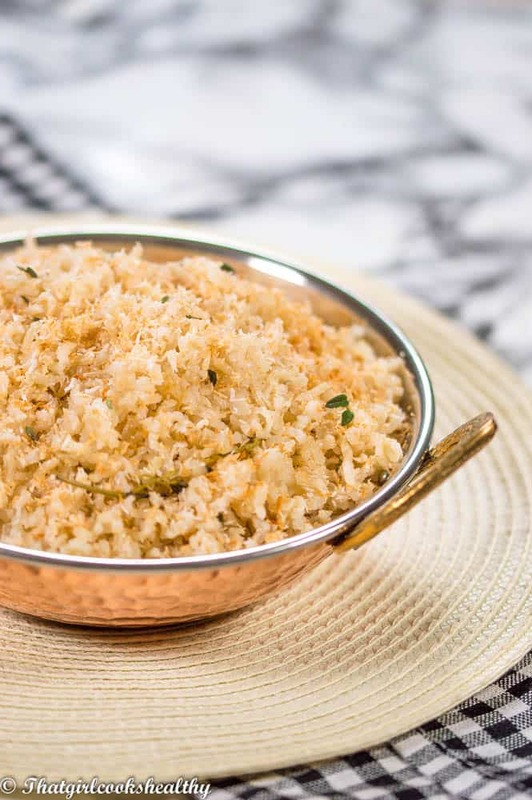 Yes, if you want to opt for a low fat content side rice dish then low fat/fat free coconut milk is a more viable option. As a general rule, rice shouldn’t be too moist and also shouldn’t be too drying either, you’re looking for a fine balance – somewhere in between (see picture). Don’t keep stirring the rice, once the rice is brought to the boil, cover and allow to simmer for the stated time. Saute the onions until soft and tender then add the coconut milk, water and additional ingredients. Add the thyme and onions to the rice with liquid before bringing it to the boil and simmering to cook. Melt the butter on medium heat then saute the onion until soft. In the meantime, heat the saucepan on high heat, add the brown rice, coconut milk, thyme, pink salt and sauteed onions then stir a few times to avoiding sticking. Once the pot begins to boil, reduce heat, cover and leave to simmer for approximately 20-25 minutes. During the allocated cooking time, ensure to check rice periodically to avoid sticking and evaporation. if the liquid has absorbed and rice is still hard, gently fold in some more water and leave to simmer for longer. If rice is over saturated with water remove the lid and allow excess liquid to dissolve. Coconut rice is my top favorite food all-time. I cook this food regularly in my home. I get some new ideas from this post. I love it to Jennifer and glad to be an inspiration. What are the red and green flecks in the photograph? Bell peppers that I used to decorate the rice.